The Minnesota Twins' Target Field will be one of the first sports venues in the country to introduce DraftServ's beer vending machines, which will reduce the long lines at concession stands, help regulate alcohol consumption, and give attendees more choice when it comes to what they're drinking. Customers first need to visit a manned register and show ID in order to purchase a pre-paid debit card in $10, $20, or $50 amounts. 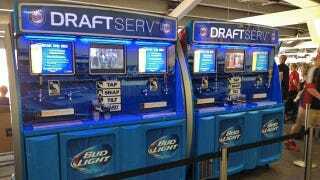 They're then free to visit the DraftServ vending machines whenever they like, and choose one of four different beers ranging in price from 0.38 cents per ounce for Bud Light, to 0.40 cents per ounce for a pale ale.